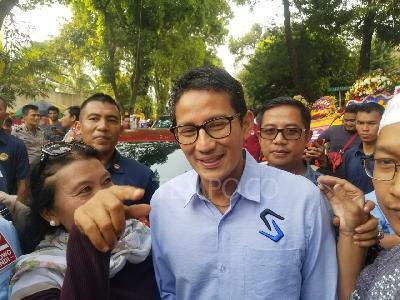 TEMPO.CO, Jakarta - The Jakarta Election Commission (KPU Jakarta) has announced that Anies Rasyid Baswedan, who pairs with Sandiaga Salahuddin Uno, has come out as the winner in the recent Jakarta gubernatorial election (pilkada). Anies-Sandi won 57.96 percent or 3,240,987 votes from a total of 5,591,353 votes, Sumarno, chairman of the KPU Jakarta, said following a plenary meeting on recapitulation of ballot count, Saturday evening. The pair defeated incumbent Basuki Tjahaja Purnama (Ahok) pairing with Djarot Saiful Hidayat, who collected 42.04 percent or 2,350,366 votes. "We will officially announced the results of the second-round Jakarta regional head election on Friday (May 5), if there is no one filing a lawsuit disputing the results to the Constitutional Court (MK)," Sumarno stated. Any candidate of the Jakarta has the right to convey an objection regarding the election results to the MK within three days (May 2 to 4), in line with the Law No 10 Year 2016 on Regional Head Elections. He explained that a witness of Ahok and Djarot refused to sign the recapitulation document as the witness expressed objection on the results of the second-round pilkada in Central Jakarta. The refusal, however, would not affect the legitimization of the pilkada, he said. Anies-Sandi won the elections in five municipalities and one district of Jakarta, namely Kepulauan Seribu District, and the municipalities of North Jakarta, West Jakarta, Central Jakarta, East Jakarta, and South Jakarta. In the Kepulauan Seribu District, Anies-Sandi won 62 percent or 8,796 votes, of the total 14,187 votes, while Ahok-Djarot 38 percent or 5,391 votes. In North Jakarta, Anies-Sandi got 52.73 percent (466,340 of the total 884,408), while Ahok-Djarot 47.27 percent (418,068). In West Jakarta, Anies-Sandi collected 52.8 percent (684,980 of the total 1,296,739), while Ahok-Djarot 47.18 percent (611,759). In Central Jakarta, Anies-Sandi collected 57.77 percent (333,033 of the total 576,449), while Ahok-Djarot 42,23 percent (243,416). In East Jakarta, Anies-Sandi won 61.87 percent (993,173 of the total 1,605,266), while Ahok-Djarot 38.13 percent (612,093). In South Jakarta, Anies-Sandi got 62.15 percent (754,665 of the total 1,214,304 votes), while Ahok-Djarot 37.85 percent (459,639).